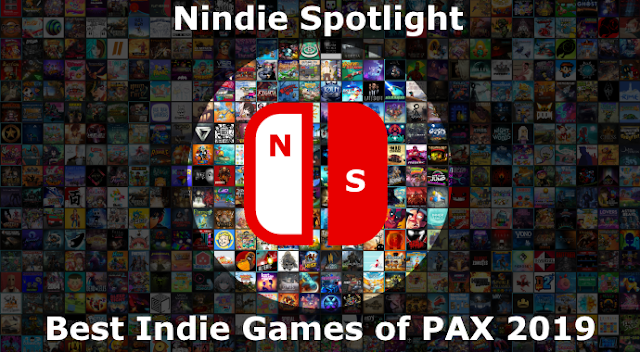 Love them or hate them, roguelikes of all flavors are here to stay and already well-represented on the Switch. 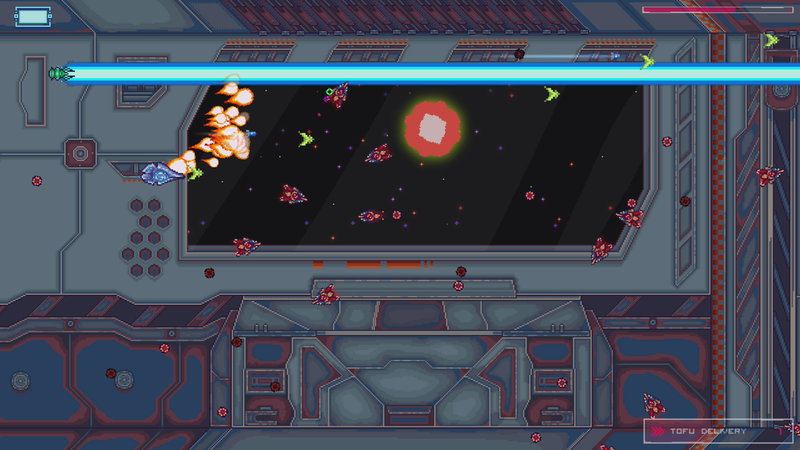 In the case of shooters they come in various forms, from the twin-stick variety with Neon Chrome to more traditional arcade shooters like Steredenn: Binary Stars. 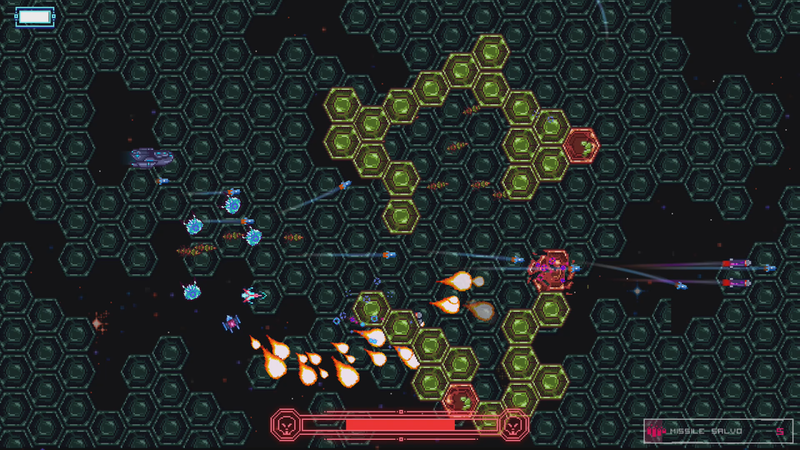 Stellar Interface brings a bit of a twist to things, offering the opportunity to choose your ship and your weaponry (though some ships are better suited to specific options), and then challenging you with some tough bullet hell boss fights, temptations, and the likelihood that your final build will rarely be quite the same even if you start from the same base. 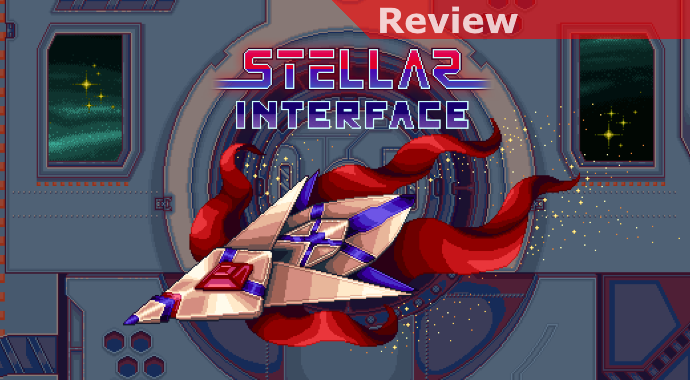 Starting out with only 2 ship options and some basic instructions from the tutorial you’ll set out on your first run and early on there’s no doubt it can be rough. Becoming accustomed to what different power-up options will give you (their names tend to give you a hint but how that works out, especially with drones, can be surprising), coming to understand that in this universe no corner of the screen is consistently safe, and getting used to making smart use of your ship’s dash are all essentials early on but don’t be upset if there’s a fair amount of being blown up involved. 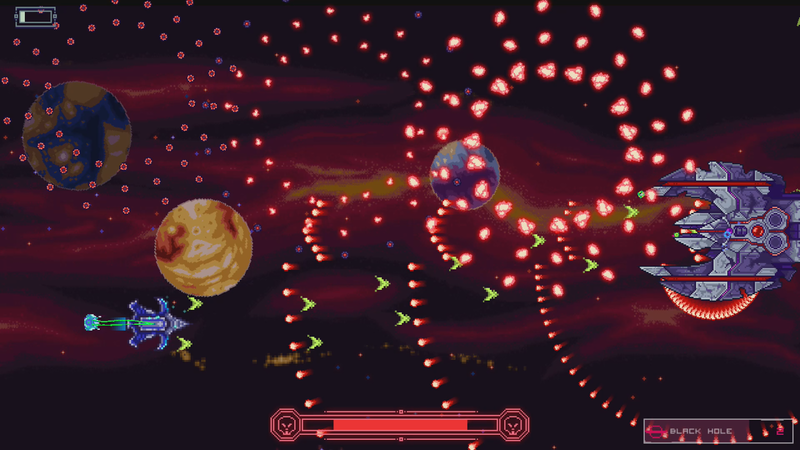 Your ultimate goal on any given run is to reach the zone’s Overlord, which will always be a boss battle that will likely take a few attempts to defeat unless you’re a bit lucky and have a great combination of power-ups on your ship. You’ll quickly learn to pay attention to the details of each node you have as a choice to go to at every step of the way. Merchants obviously provide an opportunity to switch up weapons, factories can be a serious challenge if you’re ill-equipped but provide an opportunity to unlock new and more powerful ships, and beware hitting a Lost Lord before you’ve gotten powered up a bit as that’s where former Overlords dwell. A temptation dangled in front of you on each run comes in the form of 3 optional objectives that will reward you with a random cartridge you can then use on a future run. While sometimes these are more straightforward like clearing a specific number of levels, defeating the Overlord, or avoiding getting hit on consecutive waves others will encourage you to ram into other ships or do things that can be a bit more risky. A potential gain in the next run can sometimes be worth the risk but if you don’t get a cartridge that suits your plans it may also be a bust. As you play and understand more things will begin to get easier as you’ll gain access to better power-ups, you’ll better understand which ones will be the most benefit to you, and you’ll simply be more accustomed to some of the craziness the game will randomly throw at you at times. For variety playing in Endless Mode will give you a more traditional arcade experience with everything you’ve unlocked to date being available as well as pick-ups as you go. When it comes to issues there’s no doubt that in the early going progress can feel frustratingly slow, something that isn’t unusual with roguelikes but that can be aggravating if you’re on a run of bad luck. Experimentation is a big part of finding success and that can take some time, but it also ends up demonstrating the abundance of builds the game makes possible, you just need to work to discover which ship and base loadout work for you. A focus on yourself, powering up your weapons, can have its benefits but so can going drone-heavy, depending on what you’re offered. One complication with drones can be how busy the screen gets, with it getting tough to differentiate enemies and their fire from that of your drones, but you can get used to it. I will note that some areas have backgrounds that are busy themselves and can complicate making out critical details as enemy fire comes at you from all sides, but in general it can be managed. These visual clarity issues are compounded when trying to play in handheld mode, with some elements like enemy mines getting tough to see, but on a general level you can typically manage, it’s just a bit tougher to take in all at once.